Cycling enthusiasts will spark spirited conversation with these illustrated bike path glasses. 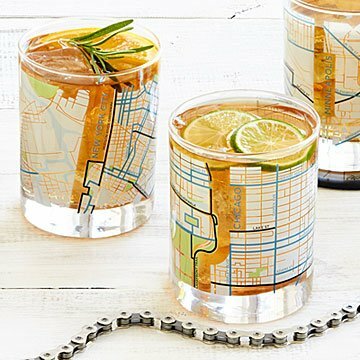 Cycling enthusiasts will spark spirited conversation with these glasses, which feature a colorful map inspired by bike path-popular parts of your favorite city. Black lines represent protected paths while blue lines represent shared ones, and select streets are labeled so you can create your own ideal routes. Reference the accompanying folded map for a full picture of the area to plan your next pedal-powered adventure. Holds 13.5 ounces each. Glassware made in the USA. Decorated in Pittsburgh. Click here to view the folded map insert that comes with the glasses: Chicago, NYC, Portland, Minneapolis, Philadelphia, Seattle, Washington D.C., San Francisco, Boston and New Orleans. 4.25" H x 3.375" diameter; 13.5 oz. These are great. My husband is an avid cyclist and finding these and being from Philadelphia I hope he loves them as much as I do I will be ordering him one of the cycling clocks for his birthday next month. "The best birthday present I've gotten"
It's personalized without costing too much. It was a very thoughtful gift that I didn't have to put much thought into at all! My sister has displayed this attractively on her bar cart. She plans to use the glasses to entertain. the glasses and the art on them is much more detailed and bold in the picture, people were reading the street names etc. I'm sure she will enjoy for years to come. Love this website! We have family members who are so difficult to buy for and you offer great choices. It's good to gift folks with the unique; thank you! Great gift idea for the bike enthusiest! A bit pricey, but very unique, and I couldn't resist because I know my daughter will love them!